There’s a record-making resurgence in Brooklyn … and the world. 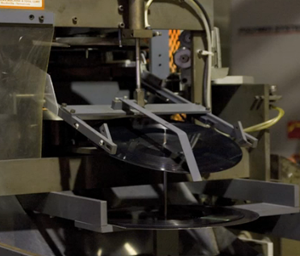 According to Nielsen Soundscan, sales of vinyl records went up by a shocking 39% in 2011 to reach nearly 4 million. And those are just the conservative estimates. Soundscan’s rankings only count barcode scans at retail stores. The RIAA says that even after accounting for returns, vinyl shipments had already reached 4 million by 2010 for an increase in revenues of 44% from the year before. This represents a mere fraction of the total music market, but an important one. Of course, Thomas Bernich didn’t know that any of this was coming 10 years ago when he opened Brooklyn Phono in Sunset Park. He had set up shop right down the street from an old repairman who had spent decades restoring now-vintage jukeboxes and arcade games, and was then on the verge of retirement. Jonathan Richardson remembers the first time he said goodbye to his entire vinyl record collection. It was in the 1980s, and the music world was converting to the compact disc. But when he nearly had to part ways with his rebuilt collection again in 2008, it was against his will. During a particularly brutal storm that year, his basement sump pump broke, causing a room dedicated to his records — roughly 7,000 of them now — to flood. Audio Fidelity has scheduled a March 13th release date of 10,000 Maniacs' 1992 album 'OUR TIME IN EDEN' as a deluxe vinyl LP reissue. OUR TIME IN EDEN was a much anticipated-and well received-recording, following the group's 1989 commercial breakthrough, BLIND MAN'S ZOO. Though that record climbed higher on Billboard's albums chart, OUR TIME IN EDEN (which reached No. 28) remained there almost twice as long, for a total of 56 weeks. On OUR TIME IN EDEN, Merchant and bandmates Robert Buck, Dennis Drew, Steven Gustafson and Jerome Augustyniak essayed their signature folk-rock sound, but toughened it up by including R&B elements; James Brown brass and reed players Maceo Parker, Pee Wee Ellis and Fred Wesley contribute, with Wesley especially prominent behind Merchant on the single "Candy Everybody Wants." "These Are the Days" was the highest-charting of the LP's three singles, topping Billboard's Modern Rock chart and reaching No. 66 on the Hot 100, though the upbeat "Few and Far Between" also fared well on the publication's dance-singles survey. Among OUR TIME IN EDEN's many highlights are the album-opening piano ballad "Noah's Dove," one of seven cuts that are sole Merchant compositions (she co-wrote the record's other six tracks), the sprightly "Stockton Gala Days" and the alternately reflective and rocking "Jezebel." Other notable participants on the album are Brazilian percussionist Paulhino DaCosta and strings arranger Paul Buckmaster, best known for his work with Elton John, David Bowie, the Rolling Stones and Leonard Cohen. Producer Paul Fox's credits include projects with Bjork, Phish and XTC. Mary Ramsey, who would replace Merchant as lead singer on the subsequent Maniacs albums LOVE AMONG THE RUINSandEARTH PRESSED FLAT, contributes violin and viola on OUR TIME IN EDEN. Merchant announced her departure from the band in August of 1993 to embark on a solo career. The Target Series was launched by Audio Fidelity last fall as a means of broadening the company's audience beyond its loyal audiophile base. Target titles sell at a lower price point but maintain the same commitment to superior audio quality that has earned the parent company its distinctive reputation. OUR TIME IN EDEN was remastered by respected Audio Fidelity engineer Kevin Gray. Founded in 2001, Audio Fidelity specializes in deluxe reissues of classic popular-music recordings for the audiophile and collector markets. The Camarillo, California-based label is best known for its 24-Karat Gold CDs and its 180-gram virgin-vinyl album editions, as well as a line of popular DVD titles. i have just about everything that donovan has released, even have limited edition signed CDs, love his old stuff on vinyl. NEW YORK, March 8, 2012 /PRNewswire/ -- There can be no better way to honor the April 14, 2012, Rock And Roll Hall Of Fame induction of perennially young British folk-pop troubadour Donovan than with the release of THE ESSENTIAL DONOVAN. This 36-song, double-CD collection of his seminal recordings from 1965 to 1973 on the Hickory and Epic Records labels, includes four tracks previously unissued on CD in the U.S. With liner notes written by Rolling Stone Contributing Editor Anthony DeCurtis, THE ESSENTIAL DONOVAN will be available at all physical and digital retail outlets starting April 17th through Epic/Legacy, a division of SONY MUSIC ENTERTAINMENT. Still actively recording and performing concerts around the world, Donovan will turn 66 on May 10th. On March 28th, Donovan is slated to perform in Los Angeles on TBS' Conan with Conan O'Brien, followed the next night by a performance at the Grammy Museum. (Please go to www.grammymuseum.org for details.) 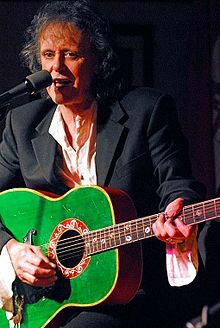 Most recently, at the Sundance Film Festival in January, Donovan headlined the 10th annual "Snowball" concert, co-starring Dawes, Zach Heckendorf, and Rodriguez. Donovan's songs, administered by BMI, have been used in countless films and tv shows over the years. THE ESSENTIAL DONOVAN lives up to its title as a comprehensive survey of that first crucial (near-)decade of his career, when his name first began to be spoken in the same breath as Bob Dylan, Joan Baez, the Beatles, and the emerging psychedelic movement. The new collection contains every one of Donovan's 18 songs that entered the Billboard Hot 100 and UK national chart between 1965 and 1973, and another 14 carefully chosen album tracks. More than half of the tracks on Disc One are heard in their mono (monaural) mix, including all of Donovan's acoustic-based folk-rock tracks recorded for UK label Pye Records (released on Hickory in the U.S.) in late-1964 and '65, and a number of Epic sides in 1966. •"Hey Gyp (Dig The Slowness)," previously unissued in the U.S., the song he first wrote with his ramblin' friend Gypsy Dave in 1965, updated eight years later on the CBS/Japan-only release, Live In Japan - Spring Tour 1973. THE ESSENTIAL DONOVAN is a reminder that he virtually single-handedly ushered psychedelia into American Top 40 radio in the summer/fall of 1966, with his first two back-to-back smash hit singles on Epic Records, "Sunshine Superman" and "Mellow Yellow." "Sunshine Superman," famously featuring seasoned 22-year old studio session ace (and future Yardbird and Led Zeppelin great) Jimmy Page on guitar, went to #1 and was inducted decades later into the Rock And Roll Hall Of Fame. "Mellow Yellow," arranged by another future Zep, John Paul Jones, rose to #2 and earned Donovan an RIAA gold award. Just two years before that, in 1964, 18-year old Donovan Leitch, an art school drop-out who was born in Glasgow and raised in Hertford, was rambling and busking with his lifelong friend and confidante Gypsy Dave, mastering intricate guitar-picking styles and refining his songwriting. Influenced by Woody Guthrie and Ramblin' Jack Elliott, Donovan was dogged by comparisons to Bob Dylan who, of course, was also influenced by the same giants. At the height of Beatlemania, Donovan's denimed visual appearance captured the imagination of his first fans on the BBC's Ready Steady Go!. He recorded his first demos for Pye Records, his longtime UK record label, and signed a prestigious music publishing contract with Peer Southern Music in the U.S. By early 1965, at the first blush of the oncoming folk-rock boom, Donovan was on the charts in the UK and the U.S. with his debut single, "Catch the Wind," from his debut LP of the same title (which also included "You're Gonna Need Somebody On Your Bond"). By the end of 1965, a second LP was released, Fairytale, containing Donovan's next three singles, "Colours," "Universal Soldier," and "Summer Day Reflection Song." In the UK, "Turquoise" became a chart single for Donovan, and the lynchpin (first track) for his third U.S. album, The Real Donovan, a combination of earlier released songs and UK tracks appearing for the first time in America on LP. Donovan's fortunes took a quantum turn in 1966 as a result of A) hooking up with hitmaking UK producer Mickie Most (known for his success with the Animals and Herman's Hermits), and B) becoming the first artist signed to Epic Records by Clive Davis, the new head of CBS Records. The summer of '66 belonged to Donovan with the "Sunshine Superman" single and album of the same name, which also included "The Trip," "Legend Of A Girl Child Linda" (one of many songs inspired by and written to his wife, Linda Lawrence), "Season Of The Witch" (covered by many artists, from the Mike Bloomfield-Al Kooper-Stephen Stills Super Session LP, to Hole's 1997 version), and "Ferris Wheel." The momentum continued through the end of 1966 and well into 1967 with the "Mellow Yellow" single and album of the same name, which also included "Young Girl Blues," "Museum," "Hampstead Incident" (the latter three all heard in their original mono mix), and "Sunny South Kensington." For most of 1967, Donovan busied himself with an ambitious double-LP project, A Gift From A Flower To A Garden, a double-LP box set (a format previously reserved for classical music) comprised of two distinct albums: Wear Your Love Like Heaven and For Little Ones, the former generally aimed at adults, and the latter intended for younger ears. Interestingly, contrary to everyone's predictions, the box set reached #19 on the Billboard 200 album chart, far outselling the volumes that were sold separately. Back with Mickie Most for his next album, Donovan's The Hurdy Gurdy Man was a sly reference to Maharishi Mahesh Yogi, the harmonium-playing Indian guru who had captivated the world (not to mention a quorum of celebrities). History cites Donovan as a key figure at the Beatles' fabled pilgrimage (with Mia Farrow and others) to the Maharishi's ashram in Rishikesh, India, in early 1968 (where, it is said, Donovan taught folk guitar finger-picking techniques to John and Paul). The album, containing the "Jennifer Juniper" and "Hurdy Gurdy Man" hit singles, reached #20 in late 1968. After two and a half years at Epic, a half-dozen albums and as many single hits, it was time for Donovan's Greatest Hits in early 1969, which included a new single to boost LP sales, "Lalena." Greatest Hits climbed to #4 and earned Donovan an RIAA platinum award. Producer Mickie Most's streak continued with the radio DJ-driven double-A sided single, "To Susan On The West Coast Waiting" b/w "Atlantis," the prelude to the upcoming album that summer. "Goo Goo Barabajagal (Love Is Hot)" utilized Most's newest stars as Donovan's backup: The Jeff Beck Group with Beck on fearsome lead guitar, bassist Ron Wood, pianist Nicky Hopkins, and drummer Mickey Waller. The Barabajagal LP (which also included "Happiness Runs") exploded out of the gate at the end of the summer and hit #23. Into 1970, the ever restless Donovan debuted a new band and a new style of 'Celtic rock' that could be heard on "Riki Tiki Tavi" and the album Open Road. His eclectic nature nudged him even further afield on H.M.S. Donovan, an ambitious double-LP project he worked on from 1968 to 1971. The UK-only album release interspersed Donovan songs with classical poetry and verse for children (from Lear, Lewis Carroll, Yeats and others) set to music. Although Epic declined to issue the album in the U.S., the label did release one single, "Celia Of The Seals." Donovan reunited with Mickie Most one more time for Cosmic Wheels, which reached #25, his last major Epic chart LP, containing his final chart single, "I Like You." Into the 1970s and 1980s, it was noted in the Rock And Roll Hall Of Fame voter booklet, "Donovan continued to tour and record, including songs for Franco Zeffirelli's Brother Sun, Sister Moon (finally issued in 2004). During the 1990s, Rick Rubin (after working with Johnny Cash) produced Donovan's Sutras. The 2008 documentary film, Sunshine Superman: The Journey Of Donovan is the essential career overview of an artist who has stayed true to his uncompromising folk roots." 17. The Land Of Doesn't Have To Be (early version, mono, 1966) previously unissued in the U.S.
18. Hey Gyp (Dig The Slowness) (O) previously unissued in the U.S. The cream of the retro rockin’ resurgence crop has announced that they’re making their long anticipated return to the shores of the United Kingdom and northern Europe this April! 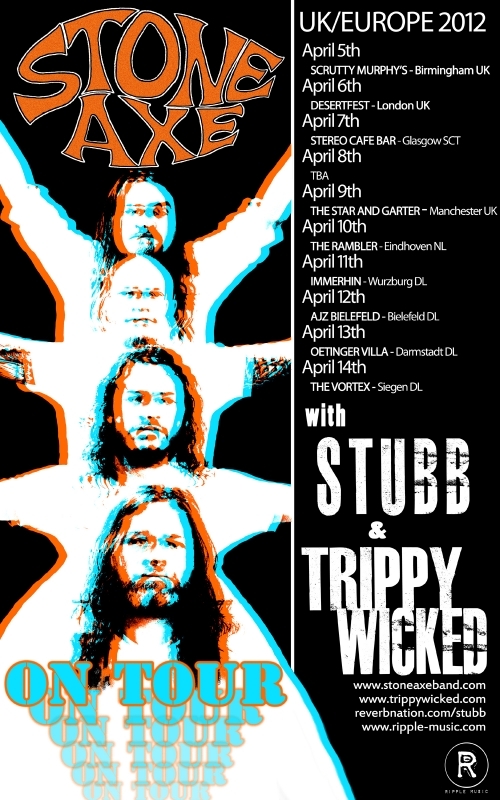 Stone Axe are loading the road cases, fine tuning the live set, and packing fresh clothes for the 2012 edition of their European Tour with Stubb and Trippy Wicked, once again, performing in the support slots. Last year, Stone Axe went overseas to support the Expanded Edition of their first album and, in the process, turned heads and made a ton of new fans and friends. This year, Stone Axe is touring in support of the 2-disc Deluxe Edition of the band’s second album, featuring the highly regarded follow up to the debut, as well as a bonus disc packed with vinyl only releases and rare oddities from the Stone Axe vault. The ten day tour will take these classic rock preservationists throughout England, Scotland, The Netherlands, and parts of Germany as they revisit some of the choice spots from the year before, and tackle new venues in search of new fans looking for a show with some substance. Of key note, Stone Axe will be performing two sets at the inaugural Desertfest held in London; one set being under the name Stone Free as the band performs a free set from the band’s greatest influence, Free! Stone Axe II – Deluxe Edition will be available in the UK/Europe by or on April 2nd, 2012 and on April 10th, 2012 throughout the U.S.
NEW YORK, March 7, 2012 /PRNewswire/ -- The Temper Trap today announce the details of their stunning second album, 'The Temper Trap', due for release on Glassnote/Columbia Records on June 5th. The record will be the band's first as a newly-expanded five-piece outfit following the permanent addition of Joseph Greer on keyboard and guitar. The self-titled album will feature 12 new songs recorded in Los Angeles with producer Tony Hoffer (Beck, M83, Phoenix). A first taste of the record in the form of album track Rabbit Hole is available to stream today via www.thetempertrap.com. The first single from the album will be opening track Need Your Love, due for release on March 26th on all digital service providers in the United States and Canada. 'The Temper Trap' is the follow up to 2009's debut long-player 'Conditions'. Featuring the singles Fader, Love Lost and Sweet Disposition, the album was one of the breakthrough successes of the year and has now sold over 800,000 copies worldwide. The band will debut tracks from the new record at SxSW in Austin, Texas, followed by a sold out tour of select US markets in March and a longer tour in June. NEW YORK, March 8, 2012 /PRNewswire-USNewswire/ -- Front Row Center, a new music television series that brings the live concert experience home, is scheduled to debut its inaugural season on public television stations across the country beginning April, 2012 (check local listings). For the premiere season, Front Row Center boasts an incredibly diverse musical line-up that spans genres and generations. The Grammy-winning, multi-platinum selling, chart topping group represents a unique set of industry power players that includes The Beach Boys; Train; Phil Collins; The Secret Sisters featuring T-Bone Burnett, Elvis Costello and Jakob Dylan; Colbie Caillat; Moby; Cheap Trick; O.A.R. ; and Richard Marx. Front Row Center comes from the producers of the ground-breaking and critically acclaimed PBS music series Soundstage, and was filmed in front of a live audience at venues including New York's historic St. Ann's Warehouse in Brooklyn and the Roseland Ballroom in Manhattan. Utilizing state-of-the-art production and hi-definition techniques, Front Row Center caters to the live music fan, with each of the ten episodes delivering top-notch performances from some of the biggest names in music. The series is a production of HD Ready and is presented by WLIW21 in association with WNET New York Public Media, and is distributed by American Public Television. The series will premiere on public television stations across the country beginning this April. In the New York metro area, Front Row Center will premiere Fridays at 10 p.m. beginning April 13 on THIRTEEN and Saturdays at 10 p.m. beginning April 21 on WLIW21. Don Maggi, executive producer of the series says, "Capturing the magic and power of a live concert, Front Row Center offers fans a high quality program and a unique experience that transports the viewer from their living room to the concert hall." "This show gives some of the best musicians in the business the ability to just do what they do best, and that's play," says Joe Thomas, Producer/Director of HD Ready. "Our job is to capture the moments that make these concerts special, so that everyone watching experiences the best that each musician has to offer." "Front Row Center is the perfect public television music series –- the top artists in their respective genres, captured with state-of-the-art technology, offering a one-of-a-kind experience for our viewers," says John Servidio, General Manager, WLIW21. "We are so pleased to bring this virtual concert tour to viewers around the country." Beginning April 5: T-Bone Burnett Presents: The Secret Sisters with Elvis Costello and Jakob Dylan: The Secret Sisters, singing siblings Laura and Lydia Rogers, showcase their beautiful harmonies and classic country/folk sound in a supper club atmosphere performing originals from their recent self-titled album as well as some of their favorite covers. They are joined by legendary guests T-Bone Burnett, Elvis Costello and Jakob Dylan. One hour. April 12: Colbie Caillat: Armed simply with her dusky vocals and acoustic guitar, this episode highlights her homespun music. In this performance, she sings her first hit single, "Bubbly," as well as the love-stricken "Realize." Caillat continues to impress with her sweet lyrics in "Fallin' For You" and falls back in love when she performs "I Never Told You." One hour. This very personal concert sees Phil Collins take his superb 2010 release Going Back into the live arena for the first time, faithfully recreating the soul and Motown sounds that he loved as a teenager. His band includes three of Motown's original backing band The Funk Brothers: Bob Babbitt on bass and guitarists Eddie Willis and Ray Monette, as well as two stalwarts of Genesis live shows: Chester Thompson on drums and Darryl Stuermer on guitars. One hour. April 26: Train: The Grammy Award-winning California rock band celebrates their fifth album, Save Me, San Francisco with highlights including "Hey, Soul Sister," "If It's Love," and "Marry Me," as well as past hits "Drops of Jupiter" and "Calling All Angels." One hour. May 3: Moby: This multi-talented and eclectic performer showcases his wide range as a musician and songwriter in this one-of-a-kind performance. With assistance from gospel belter Inyang Bassey and torch singer Kelli Scarr, Moby uses this hour of television to survey his nearly 20-year career. Highlights include "South Side," "Porcelain," "Natural Blues," and "Why Does My Heart Feel So Bad." One hour. May 10: Cheap Trick: Well known for their four decades of almost non-stop touring and new music, the group combines their famous power pop and melodic sounds as they rock out in this special concert. Seventeen studio albums under their belt make for so many great songs including favorites like "Surrender," "Dream Police" and "I Want You to Want Me." One hour. May 17: O.A.R. : From their roots as a high school band to selling out New York City's Madison Square Garden in 2006, the band has reached new heights of popularity, releasing six studio albums and one live album. Known for their impressive live shows, O.A.R. showcases their hits like "Shattered (Turn the Car Around)," as well as "Crazy Game of Poker" and "Love and Memories." One hour. May 24: Ben Harper and Relentless7: Blues, soul, folk, reggae, and rock music come together when Ben Harper and Relentless7 take the stage. With his lap steel on hand, the two-time Grammy Award winner performs a set of raw, heartfelt songs including "Steal My Kisses" and "Diamonds on the Inside." One hour. May 31: Richard Marx: A Night Out with Friends: For more than two decades, Richard Marx has made an indelible mark on the music community with more than 30 million records sold, and 13 #1 singles, and remains a radio fixture radio as an artist and producer working with some of the biggest names in the music business. In this concert, Marx takes us through his legendary career and brings along a few friends including Tony Award winner Hugh Jackman and former 'N Sync lead singer JC Chasez. One hour. June 7: The Beach Boys: Summer's Gone: The legendary group reunite to celebrate their 50th anniversary (2012) with a look back at their career featuring never-before-seen archival concert footage, plus songs from their new album. 90 minutes. Spanish thrashers ANGELUS APATRIDA will release their new studio album, "The Call", on April 30 via Century Media Records. The CD was once again recorded at Ultrasound Studio in Moita, Portugal with producer Daniel Cardoso (ANNEKE VAN GIERSBERGEN, ANATHEMA). The artwork was handled by Gustavo Sazes of Abstrata (ARCH ENEMY, KRISIUN). In 1959, just four weeks after being released, Frankie Avalon's "Venus" tops the US singles chart. Al Martino was offered the song first, but turned it down. In 1962, the Beatles (with Pete Best on drums), appeared on television for the first time when they play Roy Orbison's "Dream Baby" on the BBC program Teenager's Turn. It was reportedly the first time they wore suits onstage. In 1963, 25,000 people attended the funeral for Country singer Patsy Cline, killed three days earlier in a plane crash near Camden, Tennessee. Also in 1963, the Four Tops ink a deal with Berry Gordy's Motown label and receive a $400 signing bonus. The Dave Clark 5 made their first appearance on the "Ed Sullivan Show" in 1964. 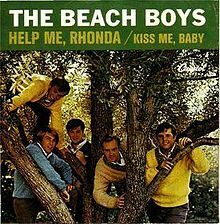 In 1965, the Beach Boys released the single "Help Me, Rhonda." It was released in March 1965 on the album Today! as "Help Me, Ronda". By that time, it had already been re-recorded; this second recording was released as a single through Capitol Records in April 1965, re-titled with the more well-known "Rhonda" spelling. The single peaked at number one in the United States. 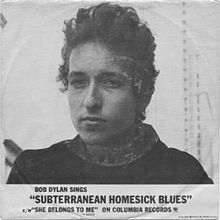 In 1965, Bob Dylan’s single “Subterranean Homesick Blues” was released in the US. The lead track from his Bringing It All Back Home album gave Dylan his first Top 40 hit on the Billboard chart when it peaked at #39. “Subterranean Homesick Blues” also is noted for its innovative film clip, in what became one of the first “modern” promotional film clips, the forerunner of what later became known as the music video. The clip was shot in an alley behind the Savoy Hotel in London, the cue cards which Dylan holds were written by Donovan, Allen Ginsberg, Bob Neuwirth and Dylan himself. While staring at the camera, he flips the cards as the song plays. There are intentional misspellings and puns throughout the clip. In 1966, at the Columbia Recording Studios in Nashville, Bob Dylan recorded "Just Like A Woman." The song was first released on his 1966 album, Blonde on Blonde. 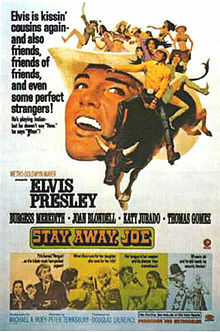 It was also released as a single in the US during August 1966 and peaked at #33 on the Billboard Hot 100. Dylan's recording of "Just Like a Woman" was not issued as a single in the United Kingdom but the British beat group, Manfred Mann, did release a hit single version of the song in July 1966, which peaked at #10 on the UK Singles Chart. In 2011, Rolling Stone magazine ranked Dylan's version of the song at #232 in their list of the 500 Greatest Songs of All Time. In 1968, in San Francisco, Cream played the first of two nights at the Winterland Ballroom. In 1968, Simon & Garfunkel recorded "Old Friends/Bookends." In 1968, Albert King, Janis Joplin and Tim Buckley appear at the reopened Village Theater in New York, now known as the Fillmore East, promoted by Bill Graham. Also in 1968, Elvis Presley's 26th feature film, "Stay Away, Joe," co-starring Burgess Meredith, Joan Blondell and Katy Jurado, opened in U.S. and Canadian movie theaters. In 1969, the Small Faces disbanded with the departure of lead singer Steve Marriott who left to form Humble Pie. The remainder of the band later regrouped as simply Faces with Ron Wood and new lead singer Rod Stewart. In 1970, after parting with the Supremes, Diana Ross gave her first solo concert performance at the Monticello Dinner Theater & Night Club in Framingham, Massachusetts. In 1971, Radio Hanoi aired Jimi Hendrix's version of "The Star Spangled Banner." Also in 1973, Ron "Pigpen" McKernan of The Grateful Dead, died of a stomach hemorrhage and liver failure, brought on by alcohol poisoning. He was just 27 years old. 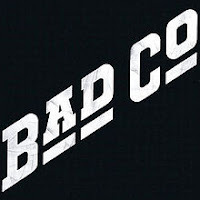 In 1974, Bad Company, made up of former members from Free (Paul Rodgers, Simon Kirke), Mott The Hoople (Mick Ralphs) and King Crimson (Boz Burrell), kicked off their first UK tour at Newcastle City Hall. In 1974, John Denver recorded "Annie's Song" and "Thank God I'm A Country Boy." In 1975, Olivia Newton-John's "Have You Never Been Mellow" becomes her second Billboard number one record. She would go on to have three more. In 1975, the New Musical Express announces that The Rolling Stones have chosen Wayne Perkins to replace the recently departed Mick Taylor. Two weeks later, The Stones themselves will issue a statement saying that Ron Wood will fill the position. Mick Jagger would say, "No matter how great Wayne Perkins is...he plays very similar to Mick Taylor." Also in 1975, actor Telly Savalas topped the UK chart with a spoken word rendition of Bread's 1971 hit "If". In 1976, former Spooky Tooth singer Gary Wright is awarded a Gold record for "Dream Weaver". In 1983, singer/guitarist Roger Hodgson announced he was leaving Supertramp for a solo career. His former bandmates went on a 40th Anniversary reunion tour in 2010. Hodgson was not invited to join them. In 1986, Diana Ross was at #1 on the UK singles chart with “Chain Reaction.” It was written and produced by the Bee Gees (who also provided the backing vocals for the single). The single became her first #1 single in the UK since “I’m Still Waiting” in 1971. In 1990, Rolling Stone Magazine let Jefferson Airplane know exactly how they felt about the group's reforming when they named their new album as the Most Unwanted Comeback of the Year. The L.P. featured all of the main members from the band's glory days, but little has been heard from the Airplane since this embarrassment. 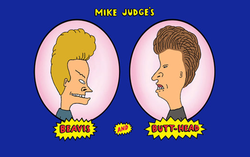 In 1993, "Beavis and Butthead" premiered on MTV as a series. In 2003, Adam Faith suffered a fatal heart attack at the age of 62. He was one of England's major Pop stars in the early 1960s and enjoyed a run of eleven British Top 20 hits prior to the arrival of The Beatles. In 2009, country music singer/songwriter Hank Locklin, a Grand Ole Opry performer for 47 years, died at the age of 91. In 2011, Bernard St. Clair Lee, a baritone singer and original member of The Hues Corporation, who had an early Disco hit in 1974 with "Rock the Boat", died of natural causes at the age of 66.